In the Spring of 1996, I was fortunate enough to be sent by my company to a meeting in Honolulu, the first time something like this has happened in my entire career. I took my wife, and we spent the week following the meeting in Maui. We rented a house in the country about half an hour from the nearest tourist spot, and mostly just rested and enjoyed the views of the mountains and the ocean. One day, however, I took time off from resting and set off to explore Mt. 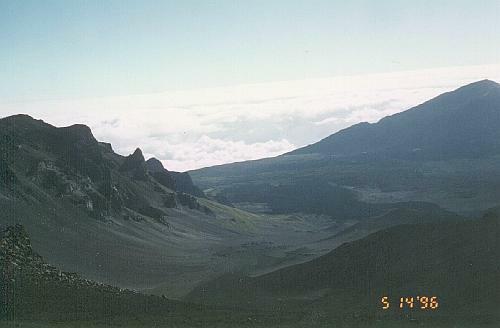 Haleakala, the principal volcano on Maui. Driving up the mountain, up numerous switchbacks, I passed hundreds of bicyclists on their way down. The tour guides haul them up, provide them with bikes outfitted with heavy duty brakes and wet-weather gear, and let them coast down. It doesn't look like they even have to pedal for twenty miles. The road up to the top travels through numerous climates, which are surprisingly sharply defined: jungle, open forest, grasslands, desert, and seemingly barren volcanic ground. On the wet side of the island, where we were staying, the sky was almost continually cloudy and the peak was hidden behind. The road punches through these perpetual clouds, into a damp zone, and then emerges above the clouds into dry territory. The rim, where the trail begins, is over 10,000 feet, and was sunny, dry, and cool when I arrived. I have always been fascinated by volcanoes. Ever since I saw Journey to the Center of the Earth as a child, I have wanted to stand on the floor of a volcanic crater. Finally, I was going to get my chance. The road goes up to the rim, but to get inside you have to walk down the trail, a drop of 3400 feet. The floor of the volcano is surprisingly varied, Besides the mini volcanic cones, it seemed to consist of two types of ground: volcanic flows and fields of rocks the appear to have rained down from above. These volcanic sand and rock fields have a smooth-looking texture from far away, and even from not so far away, but when you walk on them they are anything but smooth. The lava flows do not look smooth from any vantage point. The colors of the rocks are hard to describe, and apparently impossible for the automatic photo developing machines to get right. The accompanying photos were all taken the same day, under similar conditions, but show the same features in vastly different colors. I have tried to correct the color to match by memories, with little success. My recollection of the colors on the crater floor is much closer to the last two pictures than to the others. When I tried to lighten and redden the others, it was not right either. 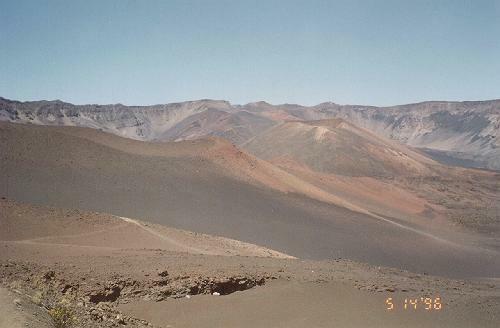 For the most part, the crater floor is surrounded by cliffs, as shown in several of the photos. There are two big gaps in these cliffs, formed by erosion and later modified by further volcanic action. The prevailing winds push clouds up and into the crater through Koolau Gap. Typically these clouds advance as the day progresses. The picture of the gap was taken early, before the clouds made it up very far. The last picture shows some of the wispy remnants of these clouds passing and dissipating in the dry, barren interior. I saw a few hikers, perhaps a dozen, beyond the immediate vicinity of the parking lot. On the crater floor, I spent the better part of the day wandering from place to place on a network of trails, without seeing anyone else. Parts of the crater are grassy, some of it is covered by silversword, an yucca-like plant growing nowhere else. But mostly it is bare lava of one kind or another. Some of the lava colors are spectacular: reds, yellows, many varieties of black and rust colors. Where covered in lush greens, it is almost impossible to the eye to take it in and make sense of it. No wonder the photo printing machines cannot cope. Looking at others' pictures, I can see that I am not the only one with this problem. 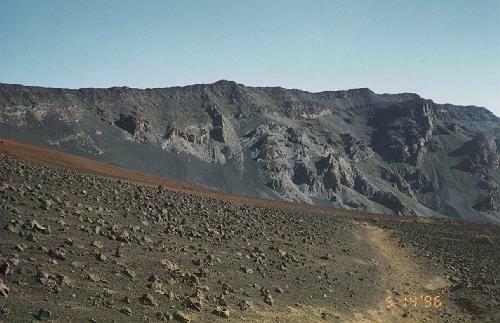 I would have liked to visit the far end of the crater floor, but there was no time for that. Heading back, I was thirsty, sunburned, and incredulous that it was so much farther back than it had been going down that morning. I seriously wondered if I would have the strength left in my legs to drive back down that road. The next day, and especially the day after that, I was really sore. Running, playing especially strenuous basketball or squash, even "normal" hiking can make me tender the next day, but I have never experienced anything quite like this. Still, I got to stand on the floor of the crater, and it was as satisfying as I had always hoped for. Just recently, however, I read that I passed near some lava tubes, that you can actually travel through, underground. I did not know this was possible. I must go back to complete this part of Jules Verne's tale. 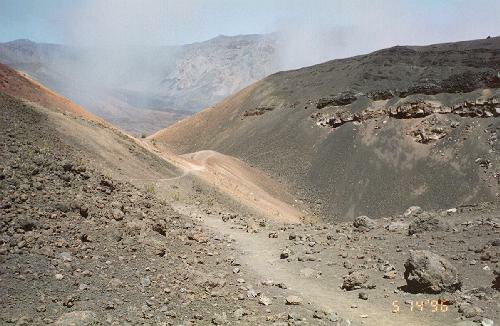 Sliding Sands trail, looking toward the crater rim where the trail originates. 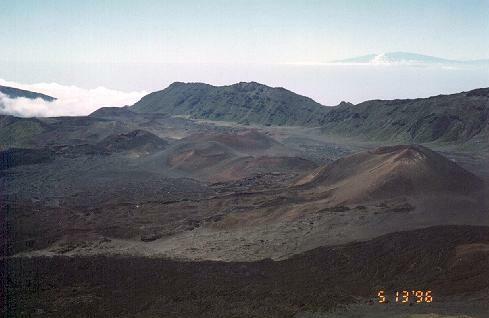 View of the interior of Haleakala crater, with many smaller craters inside. 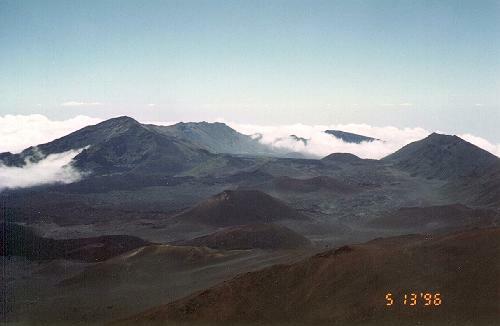 Interior of Haleakala crater, with peaks of the Big Island in the distance. 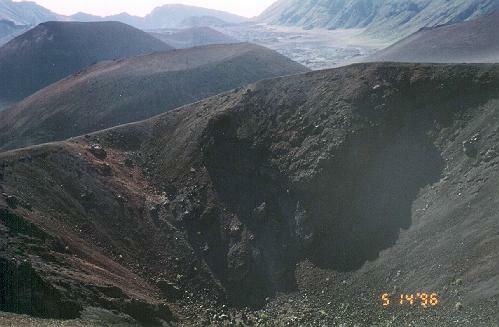 Closer view of the smaller craters within Haleakala.